Flip the Cubes. Solve the Puzzle. 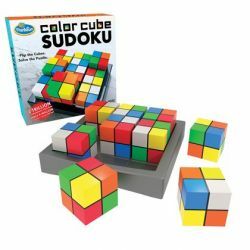 Flip & rearrange all 9 Color Cubes on the 3 x 3 tray until each color appears once in every row and column. It will take more than a couple flips of a cube to master this brilliant Sudoku puzzle. Once you've conquered the traditional Sudoku pattern, give your brain a real workout with our fun Bonus Challenges!